"Max - cosy and warm"
In 2008, California resident and animal lover Sabrina Wilkerson - searching for a dog friend to accompany her cat, Bella, paid a visit to an adoption event run through the The Chihuahua rescue of San Diego; a non-profit, no-kill organisation set up to save, shelter and eventually re-home these loveable yet abandoned creatures. 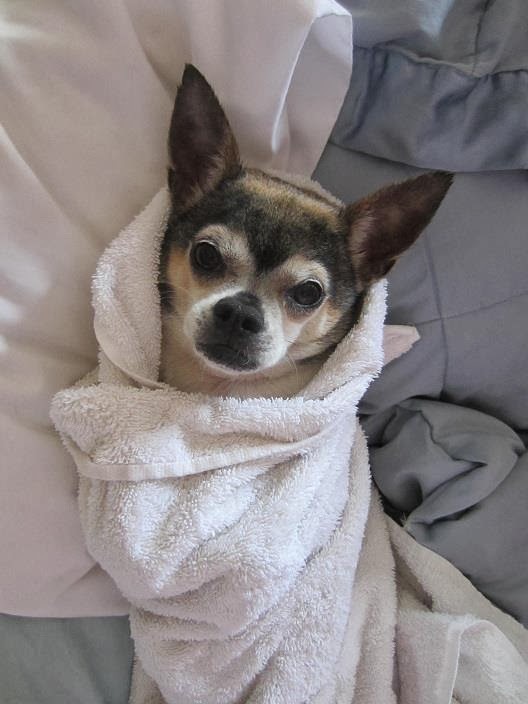 Knowing they were made for one another, rescue Chihuahua Max (pictured); who had suffered the indignant horror of abandonment by his former family - once they had produced a baby, pulled her energies towards his excitable direction. As is easy to do with animals, Sabrina instantly fell in love, and left that day with a new addition to the Wilkerson family; it turned out to be a match made in moggy, doggy, and human heaven. The aim of Foster Mamas is to adopt and care for Chihuahuas on a personal level, while promoting the plight of rescue animals across the globe till they find forever homes; from Chihuahua to Chinchilla, and all in-between. Sharing experience in order to raise deeper awareness to the realities of this world, Sabrina; who runs Foster Mamas as a one woman mission of empathy, helps prove the perception of these creatures as uncontrollable, to be a ludicrous myth; needing merely a little love, in order to bring out their true beautiful souls. It takes much effort and dedication, but she achieves these goals with a sophisticated, empathetic dignity. If you wish to see for yourself, I highly recommend visiting and liking Foster Mamas official Facebook page; an ever-growing foster community currently over 28,000 members strong. A page which in December 2013, celebrated it's first full year anniversary. "Cleo and Max - best of buddies"
As Chihuahuas enter the household - part cautious, part curious, they eventually leave happy, loved, and ready to start a new life with a fresh, loving family; fully committed to the responsibility of this little life. It is hard to let them go - as Chihuahuas rest easy on the hearts of the kind, but the Wilkerson family do not foster to serve egos, they foster to save lives. However I must note how Max - wanting a female partner in crime, decided foster Chihuahua number 17; commonly known as Cleo; a loveable former stray with the most rotten of beginnings, allowed his forever home to become hers too. Bella the cat now has to contend with a Chihuahua tag-team - but after all the rescues she has seen, she doesn't mind too much. Foster Mamas is a glowing hub for those eager to see rescue animals re-homed and happy; the caring, heart-filled middle Earth between the pain of shelters, and the pleasure of loving families. Support Sabrina's cause with a T-shirt and fridge magnet, like the official Facebook page, share this article, and spread the word about this humble of animal life saver; she is an inspiration to us all.